As the name suggest, carport shade sails are an ideal solution for building a permanent, easy to install, weather proof, shelter for your car or other type of vehicle. Our carport shade sails are covered over a strong but lightweight steel frame and supported where necessary by steel tension cables. All our carport shade sails come with a 12-month warranty on the workmanship as well as a manufacturer’s warranty. All our carport shade sails are custom made and manufactured to your exact requirements which means no two carports need be the same. Our car shade sails are long lasting and won’t sag or lose their shape. Our great choice of designs will ensure your carport matches with the aesthetics of your home or building. All our carport shade sails are custom designed so that they fit any unique application. Our team manufacture the structure here on the Gold Coast and do the installation. We see the entire project through from quote to finish! Virtually all Gold Coast drivers have experienced getting into a hot car in summer and not even being able to touch the steering wheel! Rain can damage car paintwork. A cover will also help protect your car from tree falling branches. Carport shade sails do not need to be fixed to an existing structure or we can build your carport using lightweight galvanised steel posts. Our experience in carport shade sails goes back to 1996, which means you’re dealing with experts in the shade sails industry. We understand the environment and weather conditions here on the Gold Coast, so we can help you create a carport that will perfectly suit your requirements. 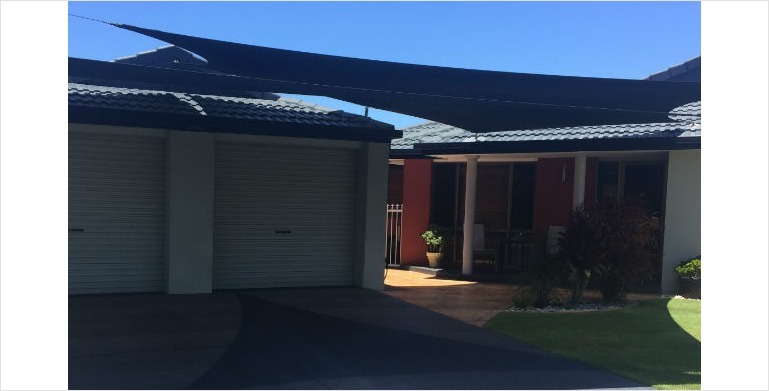 If you’d like advice about carport shade sails or you would like a free measure and quote, call our office during our business hours, Monday to Friday 8:00am until 5:00pm or Saturday from 8:00am until midday. We can custom make carport shade sails for any size commercial or residential applications.